The Ballad of Jack and Rose concerns several strange characters who just scream for something strange and unusual to say. But writer/director Rebecca Miller, daughter of playwright Arthur Miller, only gives them the most ordinary, mundane movie dialogue imaginable. 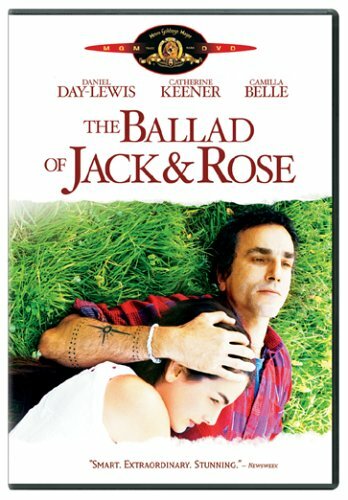 Miller sets her story, about an ailing father (Daniel Day-Lewis) and his teenage daughter (Camilla Belle), in and around an abandoned 1970s hippie commune. Father Jack and daughter Rose have lived an isolated life, farming and building tree forts, and have turned out rather odd. Jack ordinarily spends a good deal of time railing against an evil housing developer (Beau Bridges) who is looking to spoil the island. But for a change of pace, Jack impulsively invites his secret lover, Kathleen (Catherine Keener), and her two sons, chunky Rodney (Ryan McDonald) and thuggish Thaddius (Paul Dano) to move in. Although this new trio has not been raised in a commune, they're just as troubled as Jack and Rose, and talk just as blandly. With the setting established, Miller utterly fails to use the physical space to explore the relationships between her characters. She shows hills, gardens, basements and skylines, and slaps together montages set to old Bob Dylan songs: Jack and Rose pick berries, the wind blows, a caterpillar crawls, etc. Were these peculiar characters taken out of their realistic environment and given more stylized and poetic things to say, Miller would almost have the makings of a good stage play. Anything is better than Thaddeus's reaction when Rose suddenly runs off to go skinny-dipping: "wild thing..."
Only Ryan McDonald as the overweight Rodney clues in on his character's soul. He wears an ever-present orange windbreaker and uses his bookish wit to defend himself against ridicule. McDonald's sly line-readings are funny while betraying a little of the character's misery. The leads do not fare as well. Lovely Camilla Belle has a delightful smiling twinkle in her eye, but her character wanders all over the map -- especially during the movie's uncertain climactic moment -- and there's little the actress can do to correct this trajectory. To convey his character's heart disease, Day-Lewis gets to lose weight, walk with a stoop, wheeze and wear pasty makeup. It's a show-off performance meant for awards season, and Day-Lewis doesn't quite find the center. Miller's previous film Personal Velocity worked on a more intimate level, staying close to its three truthful characters. Here she has tried to raise the bar, but has missed out on the simple things.